Published on December 2, 2011 by Martyn. Be the first to comment! My year on the Creative Writing MA at the University of East Anglia seems a long time ago now (I graduated in 1994) but I have very fond memories of those days and I’m delighted to have a piece included in a special publication to mark the course’s 40th anniversary. 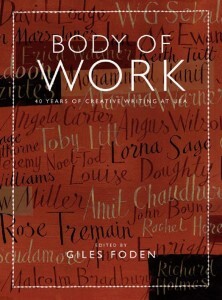 Faking It, a journalistic essay on the parallels between stage magic and fiction-writing, was originally published in The Guardian but I was asked to produce a revised and updated version for the new anthology, Body of Work : 40 Years of Creative Writing at UEA. The book, edited and introduced by Giles Foden and published by Full Circle Editions, contains a range of fiction and non-fiction from alumni of the MA and some of its tutors, past and present. The course, the first of its kind in the UK, was founded in 1970-71 by Sir Angus Wilson and Professor Malcolm Bradbury. Bradbury (pictured, leading a workshop) was one of the tutors during my year, along with Rose Tremain and writer-in-residence Terence Blacker. Bradbury and Tremain are also among the fifty contributors to the collection, along with Kazuo Ishiguro, Andrew Motion, Ian McEwan, Lorna Sage, John Boyne, Anne Enright and Tracy Chevalier (author of Girl with a Pearl Earring), a fellow student on my course. The anthology, which includes 18 previously unpublished essays, describes what it’s like to be a student, to teach on the course or be a visiting writer at UEA, as well as the excitement, disillusionment and possibilities of life as a writer in a rapidly changing world. The pieces also clarify fundamental problems across the field of literary composition, through a mix of practical advice, personal testimony and critical perspective . . . and there are plenty of amusing and illuminating anecdotes about the life and times of the MA during its illustrious history.